On 7 to 8 June 2010 NUS hosted over 60 policy makers and international academics for a closed-door seminar titled, “Singapore’s Social Policies: History, Development, Assessment and Outlook”, The joint collaboration between NUS’ Centre for Social Development Asia (CSDA) and the Center for Social Development (CSD) Washington University in St. Louis welcomed Dr Vivian Balakrishnan, Minister for Community Development, Youth and Sports as the Guest of Honour who delivered the opening address. The seminar was chaired by Dr S. Vasoo, Chairman of the Advisory Council of CSDA and Associate Professorial Fellow at NUS’ Department of Social Work, and Professor Michael Sherraden, Benjamin Youngdahl Professor of Social Development and Director of the CSD at Washington University in St Louis. Professor Sherraden is known for his pioneering work on asset building for low-income people. He has recently been selected by TIME Magazine as one of the World’s 100 Most Influential People for the year 2010. The seminar focused on Singapore’s policies on health, housing, social security and community development. CSDA was set up in 2007 with the objective to carry out applied social research and knowledge building to inform policies and programmes in social development, with a focus on Asia. 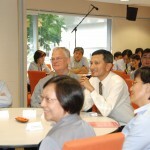 CSDA’s research projects are cooperative partnerships with CSD and similar academic centres in Asia.